Shopping for office chairs online in India offers you many choices; however when you buy office chairs online, it is best to ensure that they come fitted with a chair mechanism. Among the major advanced ergonomic features that truly make your office chair truly ergonomic is the chair mechanism, which controls how the seat and back of your office chair move. Office chairs in India come with different types of chair mechanism that include full-swing chair, synchro-tilt, dynamic and knee-tilt. However synchro-tilt mechanism is the most popular chair-mechanism fitted to most of the ergonomically designed office chairs. What is Synchro Mechanism in Office Chairs? In ergonomic office chairs with synchro-tilt chair-mechanism, the seat and back are linked, however they tilt independently as you lean back (the usual fixed ratio being 2:1). Thus for every 2 degrees of backrest movement, the office chair seat moves 1 degree. Typically most of the controls to adjust the chairs are located underneath the seat where the user can easily configure them for better comfort. This ability of the back and seat to synchronize individually allows user to tilt even while resting their feet on the floor. Since the seat and back are interlinked, your chair has a gas-lift underneath your chair with an attached lever to raise the chair or lower the chair to your preferred height. Yet another essential feature of ergonomic office chairs with synchro-tilt mechanism, water –fall seat design avoids stress on the thigh region when tilting backwards and the open seamless construction helps stimulate blood circulation in order to reduce stress on the lumbar region. This feature determines the resistance of back of the chair and is managed using a knob or lever. So whether you want to recline or sit back straight, you simply have to rotate or pull the knob. 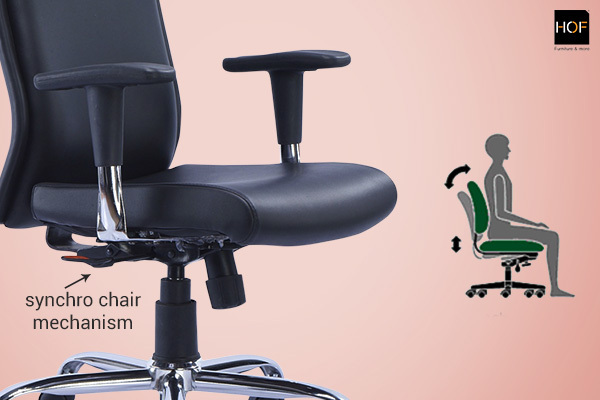 This feature also allows you to adjust the recline angle of your office chairs to your desired requirement. Choose India’s leading office chair suppliers to buy office chairs online in India that match world-class standards and assure you ultimate seating comfort. « Is Your Uncomfortable Executive Chair Affecting Your Work?